Tropical Cyclone Marcus continues to strengthen as it moves further away from Western Australia. NASA's Aqua satellite analyzed the system in infrared light to find the strongest part of the hurricane. 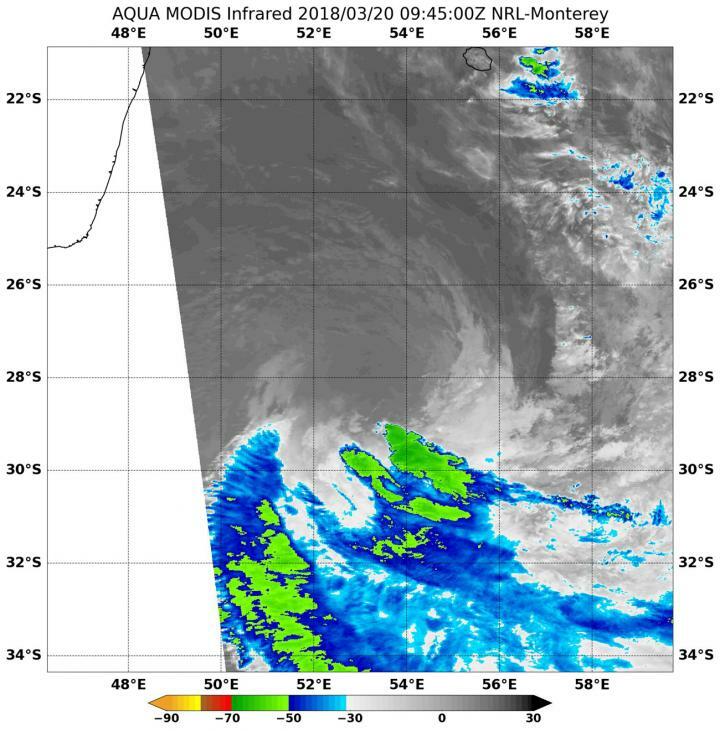 On March 20 at 2:35 a.m. EDT (0635 UTC) the Moderate Resolution Imaging Spectroradiometer or MODIS instrument aboard NASA's Aqua satellite analyzed Tropical Cyclone Marcus' cloud top temperatures in infrared light. MODIS found cloud top temperatures of strongest thunderstorms were as cold as or colder than minus 80 degrees Fahrenheit (minus 62.2 Celsius) north and east of the center of circulation. Cloud top temperatures that cold indicate strong storms that have the capability to create heavy rain. Satellite imagery showed that the eye was 11 nautical miles wide, and that bands of thunderstorms were wrapped tightly into the low-level center. The Joint Typhoon Warning Center (JTWC) noted on March 20 at 11 a.m. EDT (1500 UTC) Marcus' center was located near 14.5 degrees south latitude and 1114.5 degrees east longitude, about 399 nautical miles north-northwest of Port Hedland, Australia. The center was located over the open waters of the Southern Indian Ocean. Marcus had maximum sustained winds near 126.6 mph (110 knots/ 203.7 kph) and it was moving to the west at 17.2 mph (15 knots/27.7 kph). Marcus is a Category 3 hurricane on the Saffir-Simpson Hurricane Wind Scale making it a major hurricane. The JTWC forecast said "Marcus is expected to rapidly intensify (to a Category 4 hurricane) within the next 24 hours to a peak of 149.6 mph (130 knots/240.8) then rapidly weaken after 36 hours as it recurves southward."